On Tuesday 27th March, the Centre was delighted to welcome Prof. Sally Mapstone, Principal and Vice-Chancellor of the University of St. Andrews, to deliver the Fourth Annual John Durkan Memorial Lecture. 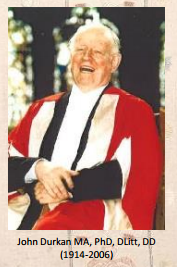 These lectures were established and named in honour of Dr John Durkan (1914–2006), an intellectual giant in the field of Scottish history, focusing on religion, culture and learning in the era of the Scottish Renaissance and Reformation. They allow us an opportunity not only to commemorate the achievements of the man himself, but also to showcase the work of his intellectual successors. Dr Martin MacGregor and Prof. Roibeard Ó Maolalaigh each provided a heartfelt introduction for the occasion, and for our distinguished speaker. Once a protégé of Dr Durkan, Prof. Mapstone specialises in older Scots and Latin literature, particularly political literature and book history up to 1707. For the occasion, she chose to discuss the use of the colophon in printed and manuscript copies of the poetic works of the famed Renaissance-era Scottish makar, William Dunbar (c.1460–c.1530). For those, such as the present writer, unversed in the vocabulary of the literary historian, and for whom the word ‘colophon’ may have prompted a swift sojourn to Google, the Oxford Living Dictionary defines it broadly as ‘a publisher’s emblem or imprint, usually found on the title page of a book’. In the below image of the title page from 1508 Chepman and Myller print of Dunbar’s The Goldyn Targe, the colophon is located at the top of the page following the poem’s title i.e. ‘compilit be Maister Wilyam Dunbar’. It should be noted that in older Scots literature, the colophon could be written or printed in either the Scots vernacular—as appears in The Golden Targe—or in Latin, using words such as Quod or Finis. Title page of Dunbar’s The Goldyn Targe in the Chepman and Myllar Prints of 1508. National Library of Scotland. At its most basic level, the colophon could serve to attribute texts to their respective authors. Sally pointed out that this was certainly true of Dunbar’s poem addressed to King James IV, Schir, I complane off iniuris, which can be found in the Maitland Folio MS. The purpose of this poem was to petition for redress for the injuries done to Dunbar by an individual named Mure, who had plagiarised his work. It makes sense then, that Dunbar would have included the colophon Quod dumbar to indicate his authorship. However, some debate surrounds the kind of redress that the author was seeking. Was Dunbar asking for compensatory gifts from the king? Or was he perhaps hoping this poem would bring about the punishment of Mure? Prof. Mapstone maintains that the answer to this question has some bearing on the way we understand the purpose of the colophon. John Burrow believes the poem is more concerned with reputation, and the poet saving-face, than securing material recompense, while Priscilla Bawcutt argues that the poem itself serves as the punishment for its subject, Mure. William Dunbar’s ‘Schir, I complane off iniuris’ with Latin colophon circled at the bottom, in W. A. Craigie (ed. ), Maitland Folio MS, Vol. 1 (Edinburgh, 1919). National Library of Scotland. Following on from this, Sally emphasised the variety of purposes that the colophon could—and potentially came—to serve with the evolution of scribal practices and print culture in the 15th and 16th centuries. For example, it appears that the colophon came to be used in prints and transcriptions of Dunbar’s work to reveal details about the recitation of the poem, or the context in which it was composed. Many of his poems in the Maitland Folio MS, for example, contain unusually detailed colophons, many of which were likely added later by scribes. These vary in tone and purpose. Some provide something of a meta-commentary, indicating the beginning and end of individual sections. For example in the copy of Dunbar’s satirical poem Tretis of the tua mariit Wemen and the Wedo found in the Bannatyne MS, it is introduced by ’here beginis…’, while Tabil of Confessioun concludes with ‘there endis ane confessioun’. Others seem to provide secondary commentary and criticism. 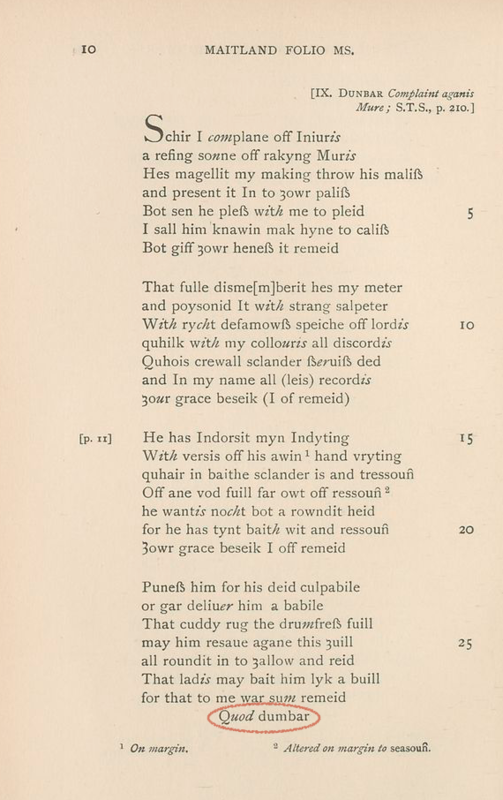 The poem Off Februar the fyiftene nycht in the Bannatyne MS contains the colophon ‘be the nobill poyet maister William Dumbar’, which may even have been an ironic stab at the author by a contemporary or later commentator. 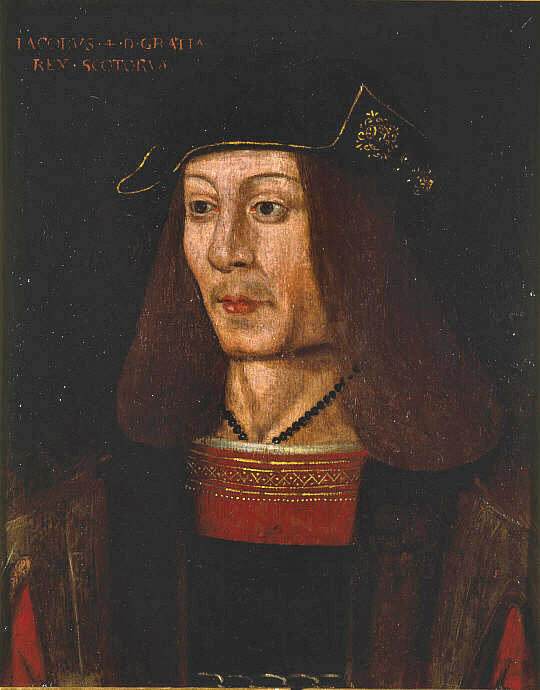 Portrait of James IV (1473-1513), William Dunbar’s patron. National Galleries Scotland. Question certainly remain concerning the origins of these colophons. Did they mainly originate with the author or the scribe? Is there any way we can discern between the two? And, perhaps most significantly, would such a distinction have been meaningful or relevant to contemporaries? These issues warrant further investigation. Regardless, Prof. Mapstone eloquently illustrated the ways in which the colophon came to transcend the conventional purpose of crediting the author. The practice itself—which Sally speculates may even have originated in the period during which Dunbar was operating—certainly appears to have become an important feature in the development of Scottish book culture from Dunbar onwards. Our next event on Tuesday 24th April is the penultimate instalment of the Historical Conversations series: The History and Literature Panel. It features the novelist James Robertson and the poet Henry Marsh. Our chair is Ted Cowan, esteemed historian and Emeritus Professor of Scottish History at the University of Glasgow. The event kicks off at 5.30pm in the Kelvin Hall Lecture Theatre. Tickets are still available through Eventbrite here. We look forward to seeing you there.